This is an organization with the aim of reaching to the less privileged, orphans, deaf and blind through active charity. It was in a bus on our way back to school, Ekiti State University (EKSU), on the 11th of June, 2014 that God gave me the mandate. Earlier on that day, we were at Erelu Adebayo Orphanage Home at Iyin Ekiti, Ekiti state, Nigeria. I almost shed tears when I saw those kids—they reminded me of what I am, being an orphan myself. When my dad died in 1996, it was like everything was gone. My mum alone was catering for the family. Nobody from his family side came to offer help. As if that was not enough, in 2004, my mum also gave up the ghost immediately after giving birth to the only child she bore for the man she remarried in 2003. Then, I came to the conclusion that all was gone, only if God would intervene. All these memories lingered in my mind while I was carrying one of the children in the orphanage. 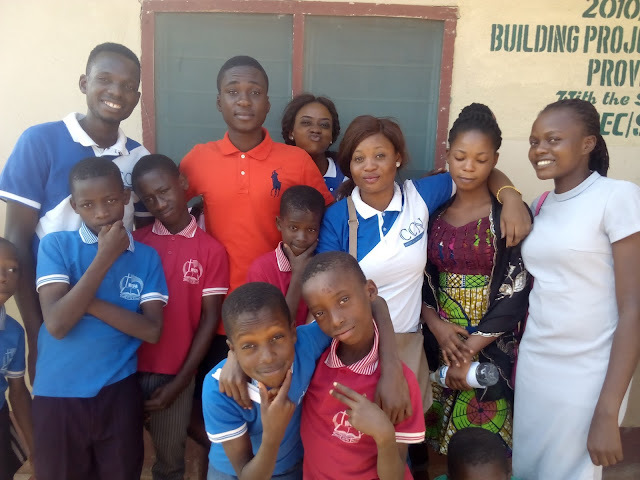 Everybody in the bus kept talking about that handsome kid that was friendly in the orphanage while we were heading to The School of the Blind (comprises both the blind and deaf) in Ikere Ekiti, Ekiti state, all in Nigeria. I had heard of the school before but this would be the first time I would be there. As Bro Wale drove in the bus, I sighted some guys playing football in the school field while some were sitted as spectators. You would never know these guys were deaf only if you were told or perhaps, because they played the ball in the school field. While we discuss the word of God with them, an instructor in the school was busy translating with sign language. The blind could hear but could not see. Sister Wura was trying to inquire from a blind brother about himself through writing (the blind could read and write) but he replied “Don’t ask about me. Tell me about Jesus Christ.” These words shocked me. So, while we were going back to school (EKSU) as I was saying earlier, the Lord told me to close my eyes until He tells me to open them. That was funny but I had to obey. The bus galloped at a particular place and I opened my eyes. “Close your eyes!” I heard Him said. I closed my eyes immediately. Later on, the bus decelerated and was parked by the driver. I thought we were already in school and so I opened my eyes again. God asked me “Have I told you to open your eyes?” I felt bad and moody. “Don’t worry. I was just trying to teach you something.” He told me that the way I was so anxious to see what was going on around me was the way those guys were also anxious to see us when we were with them. He added that we should go there often to show them more love—not only by giving them gift items but also giving them Life—Christ.